Definition at line 92 of file PatternMatch.h. Definition at line 96 of file PatternMatch.h. 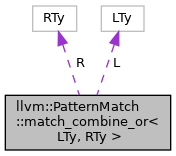 Definition at line 98 of file PatternMatch.h. Definition at line 93 of file PatternMatch.h. Definition at line 94 of file PatternMatch.h.